Normally when you turn up to lead some training at a football ground, you’re expected to know the merits of 4-3-3 over 4-4-2 and to know everything there is to know about the offside rule. Fortunately, our team could leave their boots at home as the closest they would get to the pitch was the stunning view from the Executive Box that formed their training centre for the morning. 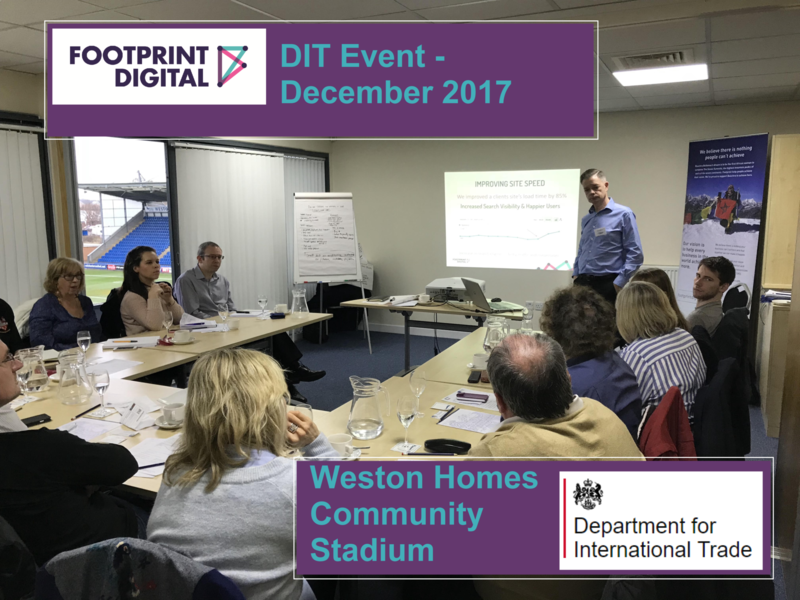 On Thursday 7 December, Tom, Dave, Reuben, and Thomas arrived at the Weston Homes Community Stadium, home of Colchester United, to run through the basics of Search Engine Optimisation, on behalf of the Department of International Trade. First things first, however, we needed to give an understanding of digital marketing in the real world. There was only one way to do this, and we soon had all of our delegates on their feet to play a little game around the principle of A-B testing. After 2 of 5 rounds, everyone had been eliminated – the fastest ever! Resetting for round 3, we eventually found our winner, and to the victor the spoils! In this case, smarties (it’s always smarties). Formalities *ahem* out of the way, it was time to explain what Google actually is, why it matters, and what SEO actually is. Thomas explained all of this in his usual unusual manner, including a story about his grandparents and facts about Baked Beans. 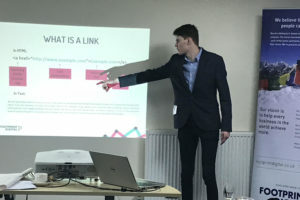 Our delegates got a great understanding of the principle behind how Google actually works, which is so essential to get to grips with before moving on to our four essential elements to making your website work well for search engines. Tom took over and ran through the first of these, Strategy, which really should underpin everything in business, if not life itself! The idea of this was to get everyone to think not just about their audience and what the website wants to achieve, but to think about their business in a way they might not have done so before. 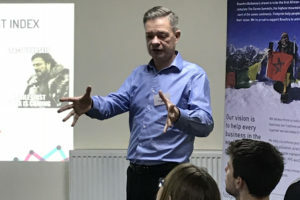 Having picked a willing victim, Tom worked through his business questions and created an understanding, before moving on to create the killer strategy around which everything else would revolve. This led on nicely to Dave taking on the second and third elements, technical and content. Firstly, it’s obviously important to have a website to begin with, but then there are myriad things to be done to turn a website into a great website that Google loves. There’s lots of under the hood, techie things in this, but Dave guided everyone through the basic principles, even if they had no prior knowledge of what makes their website run. Then, the importance of content, which is king in SEO, and how to make it count. He explained how it’s a difficult balancing act between getting the stuff on the site that Google wants to see and making sure that it’s still friendly for the user. There was certainly food for thought. Finally, Reuben stepped up and talked the delegates through the fourth and final sections, linking, which is really important to show Google that the rest of the internet loves you and your site. There were 6 main points that he had to run through to help do this, and even the presentation saying, ‘I’ve had enough lads, you’re on your own from here’ couldn’t break his stride. With the learning over, it was time to have a nice casual chat with all of our lovely delegates over a lunch of mini pies and mini hot dogs – fittingly, for a football stadium – and the opportunity to reflect on a great morning out for everyone. The DIT events are great opportunities for us to get out and meet people, teach them the bits they need to know, help them out, and have a lot of fun in the process. These sessions are completely free to attend, and everyone gets something from them, so keep an eye out for another one heading your way soon!